/ Does This Vitamin Actually Cause Cancer? Does This Vitamin Actually Cause Cancer? This powerful antioxidant helps your body fight inflammation, use vitamin K effectively, create red blood cells, and keep your immune system healthy. It’s mainly an antioxidant, neutralizing free radicals before they can harm DNA — and normally this should help prevent tumors and gene mutations. But when it comes to fighting cancer, Vitamin E’s reputation is marked by controversy – each study seems to disagree with the one before. They can’t all be right . . . So how do we know what to believe? Let’s try to sort it out. . .
A deficiency of vitamin E can create serious health problems – even aside from its effect on cancer. Lack of it has been linked to poor brain function, immune dysfunction, and increased risk of cardiovascular disease. It’s not likely you have such a serious deficiency, but chances are high you still don’t get enough vitamin E.
You’re also at risk if you eat a Standard American Diet (SAD), as E is almost completely missing from processed foods. 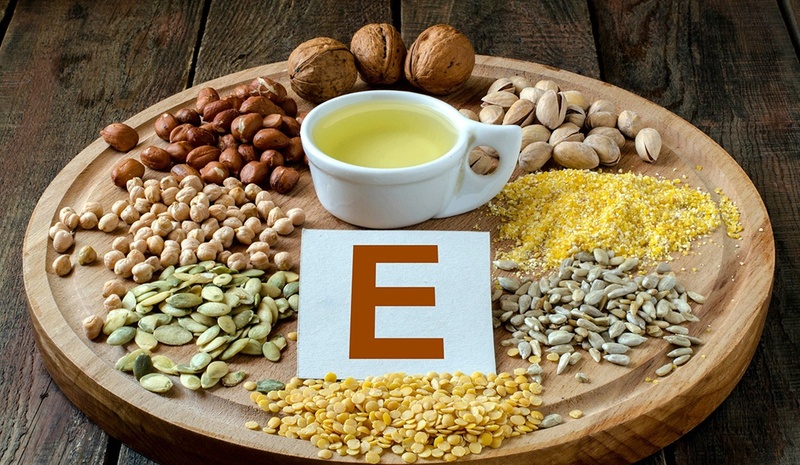 The vitamin E paradox – Does it prevent, or promote, cancer? When evaluating studies on the effect of vitamin E on cancer, you could easily come to the conclusion that it’s impossible to know the answer to that question. After all, half the results directly contradict the other half. Why does vitamin E seem to protect some people and not others? People who take large amounts of vitamin E in the form of a supplement get minimal benefit from it, but people who consume a diet high in vitamin E gain better health. The many studies that showed negative effects from vitamin E used a synthetic form of the supplement, while those showing a protective effect looked at natural forms of vitamin E-rich foods. The same seems to be true for men. Studies reveal that men who ate a diet high in vitamin E had good health status, lower PSA scores, lower cancer rates, improved heart function, and lower rates of heart disease. If you look only at the studies using natural vitamin E, the results are more conclusive. And it’s proof that a little science can go a long ways. You see, natural vitamin E isn’t a vitamin. It’s an entire family of eight similar – yet different – fat-soluble compounds – four tocopherols and four tocotrienols. One meta-analysis showed cancer prevention from consumption of naturally occurring mixed tocopherols… and lack of cancer prevention from alpha-tocopherol alone.5 Alpha-tocopherol is what’s typically found in vitamin E supplements. Indeed, you have to look hard for an E supplement that contains anything else. And even if it does, most of the time there’s only a fairy-dust sprinkling of the other forms. This study, involving 1,088 cases of lung cancer and 1,414 cancer-free controls, showed that 300 IUs per day of natural forms of vitamin E could reduce your risk of lung cancer by 61 percent.8 That’s a massive benefit. Some studies have even shown promise in the case of prostate cancer, which is particularly controversial. “Our data suggest that Gamma-T3 (one component of vitamin E) may be an effective agent in targeting prostate CSCs.”9 The study indicated that this component of vitamin E could reduce prostate tumor development by 75 percent. “This is consistent with many observations that dietary intake or plasma levels of alpha-T and other tocopherols was inversely associated with cancer risk… At the supranutritional level, however, alpha-T is not cancer preventive, which has been shown in several recent cancer prevention trials.”13 “Supranutrional” means supplementing in excess of the daily requirement. You can find various antioxidants in the natural world. But vitamin E is one of the most powerful. It works so powerfully on multiple levels that it’s been dubbed the “master antioxidant” by Andreas Papas, PhD, a renowned adjunct professor at James Quillen College of Medicine at East Tennessee State University. One of vitamin E’s most important functions seems to be protecting your cell membranes from free radical damage. Free radical damage can be like a runaway freight train – so invasive that it’s been highlighted as a significant cause of almost every major chronic disease. Vitamin E has the power to disrupt that chain reaction at the membrane’s surface. Vitamin E also shuttles nutrients into your cells and ushers wastes out. Given the potential dangers in taking the wrong type of vitamin E supplement, and the benefits of getting the right forms of E into your body, it’s important to know what to look for and how to read the label. Tocotrienols are showing great promise in the fight against cancer. Testing shows they have the ability to induce apoptosis in cancer cells while leaving healthy ones untouched. Any vitamin E supplement you take should contain a blend of all eight of these compounds. As I mentioned earlier, finding such a supplement can be a challenge. It’s worth both the extra trouble and expense. Many of the studies showing vitamin E actually promoted cancer used synthetic forms – and only the alpha-tocopherol form, at that — which your body is not likely to even recognize as a nutrient that it should assimilate. Finally, check the label carefully for any genetically engineered or soy-based ingredients. Better yet, of course, is to get as much vitamin E as possible from real foods, where the compounds are all naturally present in well-balanced proportion. High-fat plant foods like avocados and olives. Unlike some nutrients, vitamin E is relatively easy to get from your diet if you consciously eat whole foods. Supplements are best taken only if needed and in addition to, not instead of, healthy, vitamin E-rich foods. The take-away lesson is this: Vitamin E is a potent antioxidant and health protector. But to gain that effect you need a balance of tocopherols and tocotrienols. And getting them in food form is your best option. For good reason, this publication talks a great deal about foods and supplements that can cause or prevent cancer. But one of the most powerful ways to stop cancer doesn’t involve ingesting anything at all. Yet the results may be better than anything you can take.